Some winners at the 14th Rondos held in Louisville, Kentucky, from left: Steve Vertlieb, Mark Maddox, Tim Lucas, "Army of Darkness" home video producers, Jason Brower and Mark Voger. 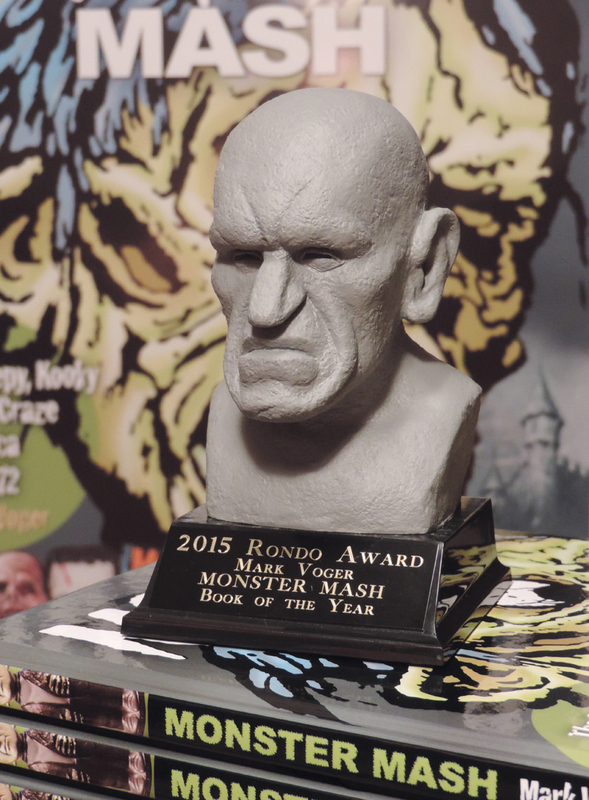 I just got back from attending the 14th Annual Rondo Hatton Classic Horror Awards held June 4, 2016, at WonderFest in Louisville, Kentucky, where “Monster Mash” won the Book of the Year Award. Yer damn straight I dragged my posterior there; the Rondo is the Oscar of classic horror, yo! The 14th Rondos was a fun, heartfelt affair with a nicely done audio-visual presentation. Kicking off the festivities was a screening of an episode of “Monstrkyd Manor,” an upcoming web series by Frank Dietz (“The Lost Skeleton Returns Again”) about a retirement home for Monster Kids. The episode stars Bob Burns, 71, whose resume is off the hizzy. Burns is a collector extraordinaire who owns King Kong armature, the wolf’s head from Larry Talbot’s cane in “The Wolf Man,” and a Kharis mask created by Jack Pierce. At various points in his career, Burns was an assistant to makeup artist Paul Blaisdell (“It Conquered the World,” “It! The Terror From Beyond Space”); a founding editor of Fantastic Monsters magazine (a ‘60s Famous Monsters competitor); a pioneer TV horror host supporting player; and an in-demand gorilla actor. “Monsterkyd Manor” cast members, including Kathy and Bob Burns (center) and Linda Wylie (in nurse costume, of course). The black-and-white episode also stars Linda Wylie, aka Nurse Moan-Eek, a presenter at the Rondos (in costume, natch). Greg Nicotero, a director and zombie creator for “The Walking Dead,” makes a cameo as himself. “Monster Mash” even makes a cameo; it’s on a table in front of Burns, next to a copy of Denis Gifford’s classic hardback, “A Pictorial History of Horror Movies.” And Burns is seen napping as he reads Forry Ackerman’s 1969 paperback “Boris Karloff: The Frankenscience Monster,” one of my favorite books in the world. Fun, funny stuff. 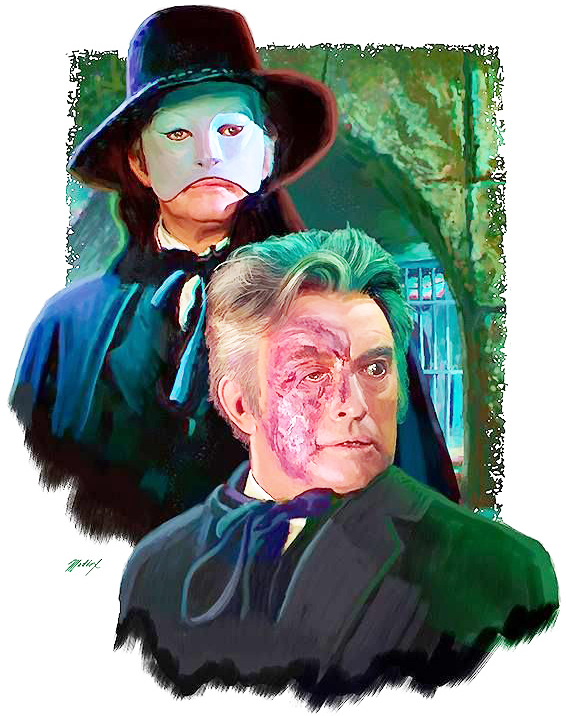 Claude Rains as the Phantom by Mark Maddox. Tim Lucas, winner for Commentary of the Year (for “Black Sabbath” and “Blood and Black Lace”), outlined his technique: Prior to recording his commentaries, Lucas carefully times his sentences to the action onscreen. Cameron McCasland, winner for Short Film of the Year for “Tailypo,” said his film is based on the folk legend he first heard as a child, which has creeped him out ever since. 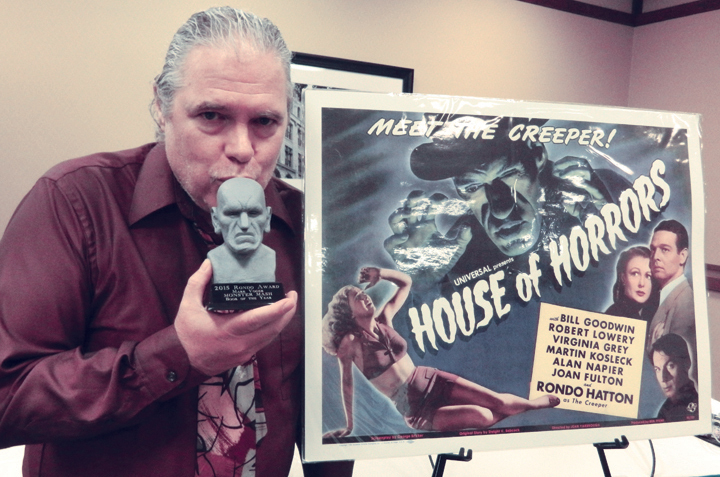 The work of Mark Maddox, winner for Artist of the Year, is classic, but he is no Basil Gogos imitator. 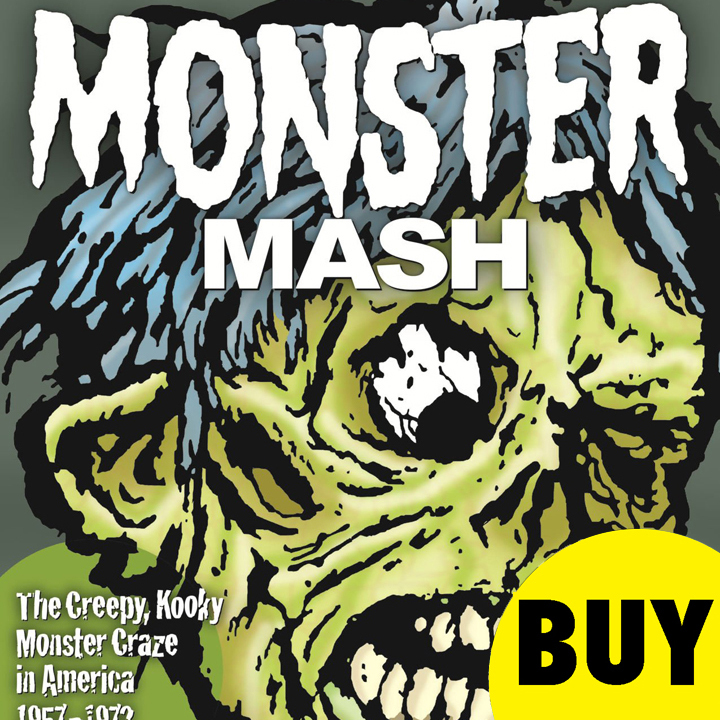 Maddox’s art is a fresh and colorful take on the old monsters. I was not surprised to learn that Jason Brower, winner for Fan Artist of the Year, is a drummer; he just looks like a rock guy. Jason’s art, too, has what I’d call a rock edge, and he seems to gravitate toward more radical-looking characters as his subjects: Max Schreck as “Nosferatu,” Conrad Veidt as “The Man Who Laughs,” withered old Mrs. Bates. Monster Kid Hall of Fame inductee Mark Redfield was on hand to pay tribute to the obsessive figure with which he is apparently obsessed: Edgar Allan Poe. A trailer for “The Death of Poe,” starring Redfield as the author of “The Raven” and “The Black Cat,” was screened. Another Hall of Fame inductee was Steve Vertlieb, a film historian and archivist who is the subject of a forthcoming documentary, “The Man Who ‘Saved’ the Movies.” In his remarks, Vertlieb mentioned that he is a Philly guy who recently turned 70. I later asked him: “Was Dr. Shock after your time?” “I knew Joe,” Vertlieb said of Joe Zawislak, who hosted horror films as Dr. Shock on Channel 17 in Philly. Later on, I hope to pick Vertlieb’s brain a little about my TV hero. When it came my turn to accept the Rondo, I had a sudden change of heart concerning my planned acceptance speech. Watch the video above (published on the Rondo Awards Channel), and find out why HERE. 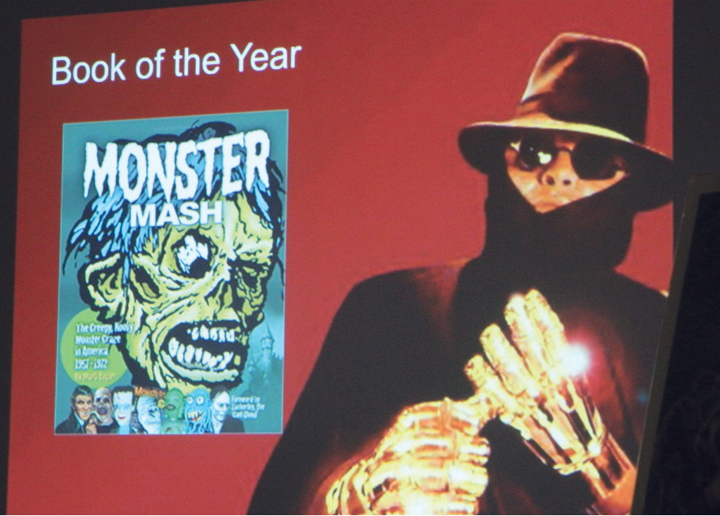 This image of Peter Lorre in “Mad Love” was projected on the screen for the Book of the Year category. What can I say? I love Rondo Hatton. “Pearl of Death,” yo! My 2017 Christmas greeting. There’s no Photoshop trickery here … he’s really wearing a Santa hat and bow!